TEACHER TRAININGS & ADVANCED TRAININGS in Germany, Switzerland and Sri Lanka. 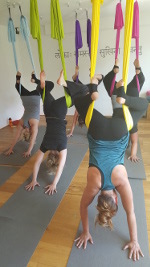 DANA® AERIAL YOGA Deep is a therapeutic form of DANA® AERIAL YOGA. In the Deep variation the hammock is installed 15 cm above the ground. 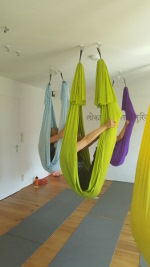 The practice involves swinging and circling movements which create a sense of zero gravity. All parts of the body are reenergized and get softly mobilized. In alignment with your breath a positive vital energy is stimulated. In the advance teacher training you will acquire the skills to sequence and teach a Deep practice. DANA® AERIAL YOGA Flow combines the Asanas in a flow sequence in alignment with your breath. As in Hatha yoga the practice starts with a variation of the sun salutations in the hammock. The sun salutations combine with the 12 Surya mantras. In the advance teacher training you will acquire the skills to sequence and teach a Flow practice. „Enjoy the flow of life!" The DANA® AERIAL YOGA Advanced Teacher Trainings are 3-day- courses containing 25 lessons (1 lesson is 45 min).